Kirsty Graham (University of York) examines the contradictions in a new documentary about Jane Goodall. Since the 1960s, when National Geographic first produced a film about her work with chimpanzees, Jane Goodall has been an inspiration to future naturalists. Goodall has been particularly influential for young girls, by showing them that women can be field biologists too. When I meet someone new and tell them that I study primates, the most common question is: ‘Are you going to be the next Jane Goodall?’ And I then have to think about all of the complicated thoughts that I have about Jane Goodall as a person, a primatologist and a representation. The documentary Jane, showing Jane Goodall’s life at Gombe, Tanzania, really brought home those complicated feelings for me. First of all, Jane Goodall, Diane Fossey, and Birute Galdikas have left a lasting impact on how the world sees primates. They captured the world’s imagination with their descriptions of great ape behaviour: Jane Goodall found that chimpanzees use sticks to fish for termites – they use tools! This was the first time tool use had been seen in a non-human species. Primatologists today stand on the shoulders of these early pioneers. The chimpanzee footage in Jane is beautiful and captures the awe of seeing chimpanzee behaviour for the first time. The film is also tragic – I cried at three separate points at the images of sick and injured chimpanzees. But it’s seeing chimpanzees interacting with humans that brings up problems. 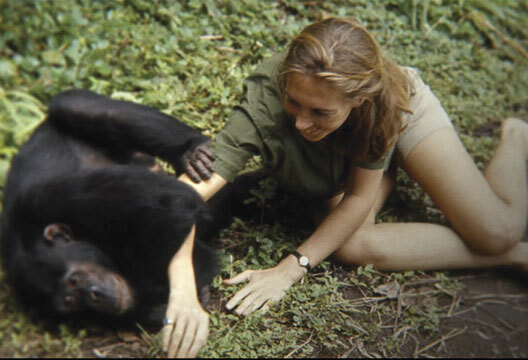 In the early days at Gombe, Goodall fed the chimps and came into physical contact with them. The film shows the aggression at the feeding sites and the vulnerability to human diseases, both reasons that most primatologists (including Goodall) stopped interacting with primates in that way. But those iconic photos and videos remain embedded in public imagination. The feelings of awe, compassion and fascination that they inspire have been used to effect great good in the conservation of wild apes and the welfare of captive apes. At the same time, today we have substantial and highly profitable pet trade, tourism and ‘entertainment’ industries built on getting to touch, feed and take photos with other primates. Jane Goodall, as a person, does an immense amount of work to conserve primates and combat the primate pet trade, which is why those early images are so complicated. The actions of Jane the person conflict with Jane the public representation. My biggest issue with this documentary is that primatology is often displayed and described as ‘white researcher goes into empty African wilderness’. That’s hugely problematic. In this and other documentaries about her, Goodall is portrayed as an attractive, young, white woman in an empty forest with chimpanzees. Black bodies are used as background images or instruments for transporting people and goods, which mirrors their exploitation in the political economy of colonialism and slavery. But Tanzanians are never allowed to engage in the plot. There is an unfortunate editing choice at one point in the film where Jane is narrating about how lonely and isolated she felt without anyone around, but which has been overlaid on images of Tanzanian field staff carrying food and water. Erasing people from the context of fieldwork is awful – it is a privilege to conduct research in another country, and that research would be impossible without the support of national government, researchers, academics, field assistants and staff. International researchers should reflect that in their work, and filmmakers could do well to represent it. When Goodall speaks at conferences, she emphasises the importance of people in her research and conservation, and the need for collaboration among everyone. So again, Jane Goodall the person conflicts with Jane Goodall the representation. I don’t want this review to be misleading – I really enjoyed this documentary. It has a beautiful score, by Philip Glass, and breath-taking cinematography, and tells the story of a young woman learning about chimpanzees and finally moving on to fight for their conservation and protection, both in the wild and in captivity. It also gives an interesting glimpse into Goodall’s personal life with partner Hugo and son Grub. This film is well worth the watch, and maybe with this review in mind you can consider the ways in which a 1960s representation could do with updating.